This is Greg. He will typically get the hiccups more than once during a game. It's really annoying. 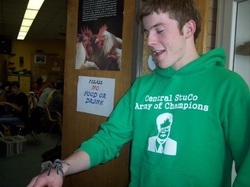 Also, he brings that spider to all of our games, and he'll probably yell at you for "getting too close to him". We apologize in advance.